Closing on the eve of her Oscar-winning film debut in Mary Poppins, Andrews’s memoir focuses on a young and, in most respects, rather ordinary girl with a complicated home life and a freakishly precocious larynx. Christened Julia Wells, the author writes evocatively of her youth in bomb-ravaged London, and of accompanying her musical mother and stepfather (the source of her current surname) as they worked the punishing music-hall circuit, dogged by alcoholism and precarious finances. Prepubescent Julie, with her strikingly mature coloratura, eventually became the act’s star attraction and the family’s chief breadwinner. All this is clearly and elegantly presented—Andrews’s limpid prose style has earned her considerable success as an author of children’s books—but curiously muted, as she admits to generic feelings of sadness or stress but declines to further explicate her inner life. It remains unclear whether this is simply the evidence of a fundamentally reserved personality, or if Andrews lacks the complexity usually associated with artists of her accomplishments. Her oddly bloodless accounts of her relationships with her feckless, selfish mother, overbearing, mildly predatory stepfather and loyal first husband offer few clues. Andrews conveys real feeling only when discussing her beloved father, Ted Wells, a gentle teacher and nature lover whose simple enjoyment of hearth, home and the natural world seems central to her cozy worldview. The latter half of the narrative is manna for musical-theater buffs: Writing about her phenomenal Broadway successes in My Fair Lady and Camelot, Andrews provides entertaining gossip about Rex Harrison, Richard Burton, Lerner and Loewe, and Moss Hart, as well as insightful, informative analysis of the technical aspects of her craft. 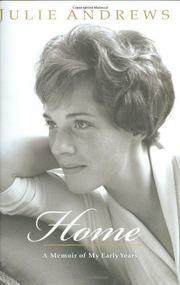 Bears out the suspicion that Richard Stirling’s unrevealing Julie Andrews: An Intimate Biography (2008) faithfully reflects its subject’s personality.